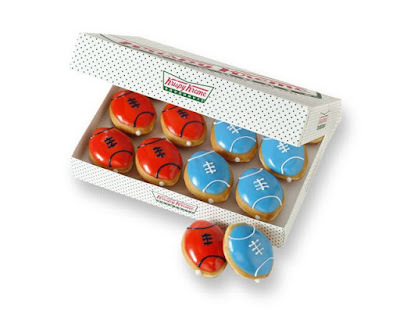 Krispy Kreme is offering two new football donuts to represent the two team playing in this year's Super Bowl. The Kreme-filled, football-shaped donuts are either dipped in blue or orange icing for the Carolina Panthers and Denver Broncos, respectively. Additionally, the blue football donut is decorated with white icing "laces," while the orange football donut includes laces of navy blue icing. Both donuts will be available at participating Krispy Kreme locations through February 7, 2016 (AKA Super Bowl Sunday). The donut chain plans to track which donut is more popular nationwide leading up to the Super Bowl and post the daily results on its various social media channels.